Zhoushan Ocean Science City plans an overall layout of "one core, two zones and many points". The core area will be about 12.3 square kilometers, with “Dayongdong” and “Science Innovation Park" as its central part, radiating over the whole Zhoushan Archipelago New Area. Zhoushan Ocean Science City considers an efficient service industry to be the initial source of development of the Zhoushan Archipelago New Area. 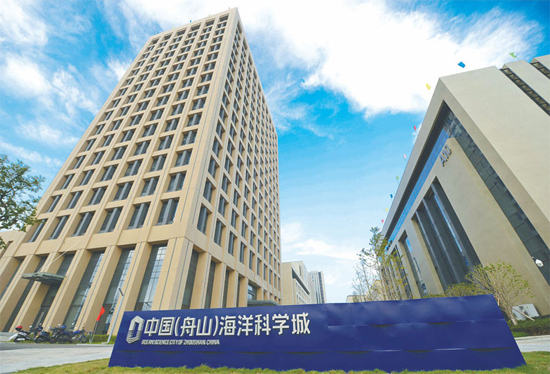 It serves the development of the city's marine economy by promoting marine science and technology, acting as an application demonstration opportunity and industry incubator for ship and marine engineering equipment design, as well as exploration of marine geology and marine biotechnology. Meanwhile, it provides support for the Service Center of River-sea Combination Transportation as well as the Zhoushan Port Free Trade Zone by promoting marine data, marine communications, electronic commerce, maritime services and cultural and creative services. As the marine science and technology innovation center, the marine high-tech industrial function area as well as the incubator and transformation platform of the Marine Industry Cluster Area of Zhoushan Archipelago New Area, Ocean Science City has gathered resources of marine science and technology innovations to foster scientific and technical personnel related to marine science to help transform traditional industries and develop emerging ones.